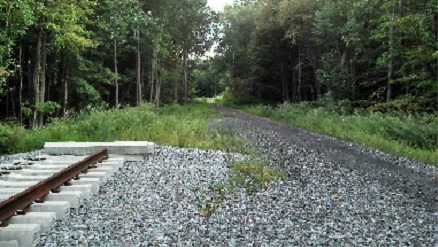 The Scranton to New York City Rail Restoration Project is a federal "New Starts" rail restoration project that is under construction and continues making progress toward its terminus in Scranton, PA.
All the feasibility, environmental and preliminary engineering approvals have already been completed on the 133 miles from New York City to Scranton. These studies have successfully been completed through the $10 million plus in state and federal funding sources which have already been invested in this project. Track is being laid on the first seven miles of the Lackawanna Cutoff in this project to the first new station to be constructed in Andover, New Jersey in this first construction phase of the ongoing project. 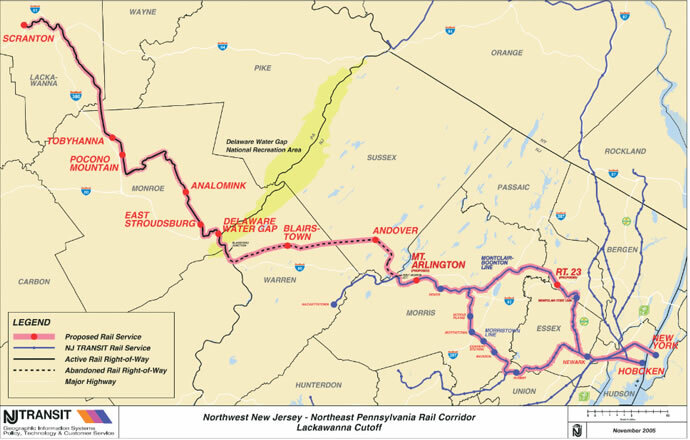 The construction will then proceed to replace the remaining 21 miles of rail missing on the Lackawanna Cutoff in New Jersey and make the connection to Pennsylvania Northeast Regional Railroad Authority (PNRRA) owned existing operating mainline that runs from Delaware Water Gap to Scranton, PA.
With the recent opening of the Scranton Intermodal Terminal on Lackawanna Avenue we also have met another federal requirement of providing a federally approved intermodal station for the restoration of rail passenger service to Scranton. All local, state and federal entities are now collaboratively working to continue to obtain funding at all levels to continue the construction of the Lackawanna Cutoff and bring the new rail passenger service to Scranton. The meeting drew a standing room only crowd of over 200 people voicing their support for this vital transportation and economic development project. This effort was highlighted and given new and substantial support at the regional meeting that was held at Pocono Manor on October 13, 2015 at which time the Administrator of the Federal Transit Administration (FTA), Therese McMillan, (who is currently funding the ongoing construction and new station in Andover, New Jersey), along with Congressman Cartwright and Pennsylvania Secretary of Transportation, Leslie Richards participated in a joint briefing about bringing the project to Pennsylvania. The federal feasibility and environmental studies that have been completed have identified our northeastern Pennsylvania (NEPA) region as a primary travel destination for 1 million residents from the New York/New Jersey area. Our recreational opportunities at our National Parks, resorts, ski slopes, shopping venues and sports facilities (especially like the Lackawanna County/NY Yankees Triple A Baseball Stadium and Kalahari Waterpark and Resort) are primary venues for visitors and tourists from the NYC region to travel to and stay in NEPA. According to these studies nearly 15% of the tourism dollars spent in Pennsylvania are spent in NEPA. With tourism becoming one of our region's fastest growing industries alternative and efficient transportation options are required to fuel and increase the growth of the tourism industry. For example, since a large percentage of NYC region residents do not own automobiles it is vital to provide a modern and efficient passenger rail alternative to get to NEPA to partake of our growing tourism industry. It is also known that most of these NYC region residents use the modern and efficient rail passenger system in the NYC area daily and therefore a modern and efficient train service to NEPA would be a preferred option. Another exciting area of economic development that the rail passenger service project would directly produce is the attraction of back office and perhaps home office professional businesses that are related to the New York City/Northern New Jersey Megalopolis (the Wall Street West Initiative). These businesses are related to the financial, bio science, educational and information technology industries and this sector demands modern and efficient rail transportation between NEPA and the NYC headquarters of these businesses. The new modern passenger equipment envisioned for the Scranton to New York City passenger service would successfully provide this element by providing comfortable, reliable, all weather, WIFI equipped equipment that would allow its riders to use the train as an extension of their business offices. It should also be recognized that these studies identified over 20,000 Pennsylvania commuters (Pennsylvania citizens with residences in NEPA) who have jobs in New York City and northern New Jersey and must commute on Interstate 80 which is becoming a parking lot during rush hours in the morning and afternoon. This traffic condition will become even worse with the addition of truck traffic which is expected to double in the next ten years especially from the increase expected when the larger ships are diverted to the New York harbor from other ports because of the Panama Canal widening. These NEPA residents may lose their ability to get to work without the alternative that modern passenger rail service will provide. Scranton, Lackawanna and Monroe Counties grew to national and international prominence because of the rail system that was first developed here over 180 years ago. We retained this prominence when we saved most of our rail system when the private railroads were abandoning and liquidating it over the last 30 years. Restoring the rail connection to New York City from NEPA will also restore the economic vibrancy that will once again tie our fortunes and future to the largest financial and professional capitol in the world. Governor Casey, Governor Scranton and Senator Specter proclaimed the restoration of rail passenger service to New York City to be the "greatest economic development project to ever affect Scranton and northeastern Pennsylvania". This restoration project has finally started in New Jersey. We collectively need to finish it in Scranton and NEPA and restore the direct economic link to bring a whole new white collar sector of industries and businesses to northeastern Pennsylvania and provide the kind of jobs that will help address one of our most important missions which is to provide the type of jobs our younger generation needs to remain in NEPA.